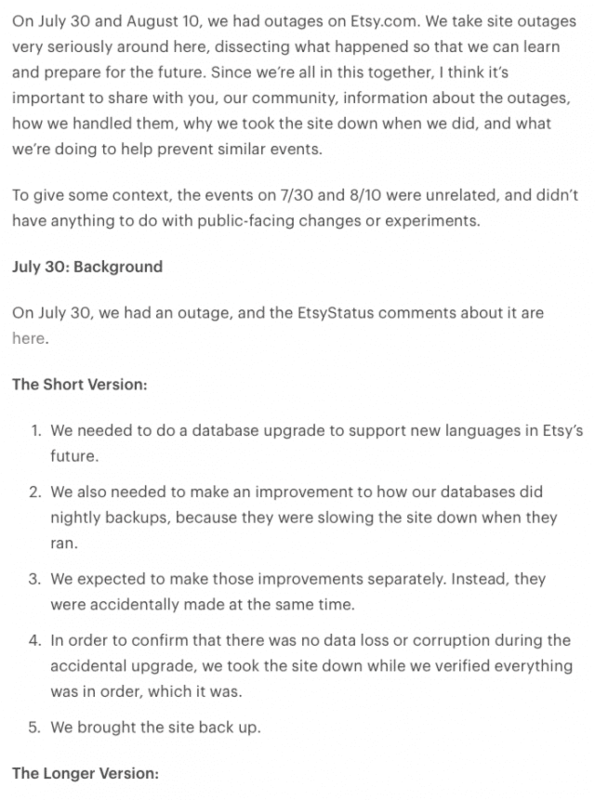 I love the psychology that goes into post-outage write-ups. 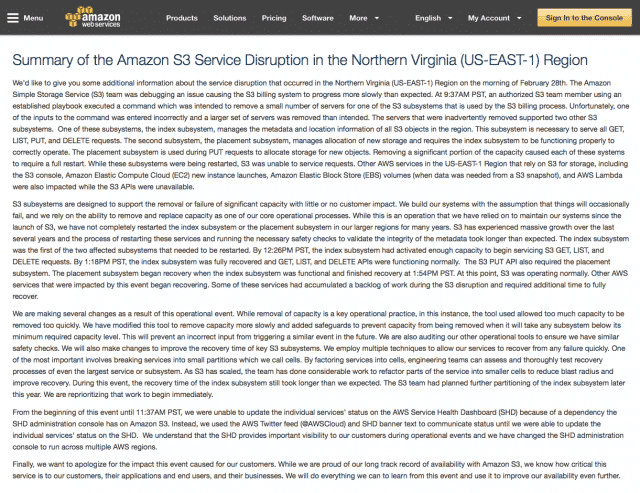 Amazon just had a doozy, with S3 going down and crippling much of the internet for a day. The image above captures their approach to the narrative, which I would classify as dense and opaque. You probably don’t have time to read it all the way through. It’s lots of text, so it’s thorough. It’s small text, so it’s probably deep and technical. The response was legitimate and my confidence in them is restored. And here’s a near-opposite approach, by Etsy. We take our lumps when we deserve them. You can trust us to do the right thing for you. Different customers will respond to different messaging, and situations might also call for different approaches. Maybe when you take down half the internet you need to be a bit more formal than when there’s a hiccup in some API. Post-outage announcements are clearly more art than science, but I find the difference in approaches fascinating. I personally prefer the Etsy approach to Amazon’s, as honesty and transparency rank high on my list of desired traits in a partner. Either way, the next time you read one of these, think about the non-textual communication that’s being used through text size, paragraph density, tone, and similar meta. It might tell you more about the company you’re dealing with than the text itself.